1) Does the starting five really fit Coach Clifford and Alfense? Very hard to begin the blog with positives when the most talented Horncat squad ever is 1-3 and the 3rd worst offensive team in the league…. It’s seemingly easy to understand the motive behind our moves during the summer even if you’re analyzing it while sitting behind a computer in another continent. Despite our last year success, only two of our starters (Al and Kemba, and even with him it’s not certain) would have been locks to start for any other playoff team in the league. Coach Clifford had set a defensive foundation that allowed our limited, yet hard-working players to succeed in this league and now it was time to add some talent to take the next step, even if the fit wasn’t quite there. We acquire Lance Stephenson on a deal that is superb (rarely do you get the opportunity to steal a 24-year-old borderline all-star from another team) even if this doesn’t work out and start looking for a power forward who would help us with long-range shooting since Lance is shaky in that part of the game. Whether Marvin Williams is the right man for the job is a topic for another discussion, however, I have to question Clifford if he’s even using Marvin the right way. The concerns about Marvin’s three point percentage from the right side of the court were legitimate (honestly, I can’t figure out where to find short charts on this new stats.nba.com design, but either way that’s the one spot from which he has been bad). That’s the place from which, per example, Anthony Tolliver could get open looks off Al’s post-ups, which traditionally take place on the left side on the court. The thing is though – we have no freaking idea how Marvin could shoot from there since our only dangerous three-point threat is placed in an absolutely worthless place whenever Al posts up. I mean, Marv has one specific skill that makes him a starter and that is shooting. What good is he if he spends half of Al’s post-ups near the paint!? An offensive rebound from him is unlikely and if you expect him to make a cut along the baseline (or from any place for that matter) and catch a pass from Al then you better look up Antetokounmpo’s block on Marvin (by my observation, the only time Williams has so far attempted a cut during a Jefferson post-up). Al is no Marc Gasol, but, man… With Lance prone to wandering around and MKG usually being there in Marv’s spot near the other side of the paint, it’s simply impossible to make that pass to Williams who’s standing in the opposite corner. Part of the blame might be on Marv who needs to have the right feel for the game and start a movement alongside the three-point line to the top of the key, but you can’t deny the fact that our only floor spacer is put in positions where it’s impossible for him to space the floor. The bet of successfully playing with a Roberts/Neal/Henderson/Zeller/Maxiell line-up on the court seems to be an unlikely one. It’s a line-up we have rolled out for what would have been nearly 7 minutes per game if MKG wouldn’t have got hurt (I’m counting the minutes Hairston played with them in New Orleans as the same line-up) and the game clock does seem to tick a whole lot slower while you wait for Lance to check back in after Kemba has taken a seat. You’re basically banking on Neal to keep the Hornets close with his jumpers, while the other team has two starters out there since their coach has heard of a thing called “staggering minutes”. They will often have a tough time scoring and Clifford seriously needs to figure out a way to make sure a starter is on the court at all times. It could, perhaps, be the moment where Lance Stephenson enjoys freedom outside of Alfense and creates for others. 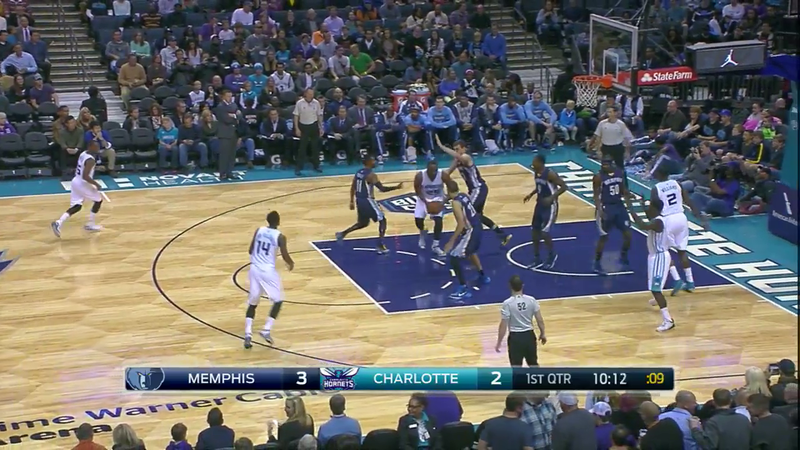 Last but not least – Jason Maxiell shouldn’t be playing. I don’t even want to get in to this and present you video examples. Just a watch a second of him playing basketball and you can conclude that he is in no shape or form ready to play minutes as a center in the NBA. No matter how hard-working he is or how well he can read offenses, he’s simply not fast enough and athletic enough to protect the paint. At this point I don’t care if it’s Vonleh or Biyombo who get’s his minutes as long as Maxiell doesn’t hit the court. Honorable mentions: Kemba Walker’s shooting (33% in catch-and-shoot situations), Jason Maxiell, Al’s slow start to the season on offense, the fact that this isn’t just a slow start for Al on defense, Jason Maxiell, Kemba and Lance falling asleep on defense from time to time, Jason Maxiell and Jason Maxiell. He’s 4 for 6 on jumpers between 16 and 24 feet after the 3 games he has played. Mike also shot twice as many free throws per 36 than he ever has for a full season before. He looked confident, exercised the opportunities he has on offense, played with the most heart and probably was the best player on our team before going down with that rib injury. I swear I can’t remember the last time when we’ve run something like this with a capable ball catcher and a three-point threat just dangerous enough to keep Anthony Davis from helping out on the pick-n-roll. This entry was posted on November 5, 2014 by ReinisLacis in Charlotte Hornets blog and tagged Al Jefferson, Cody Zeller, Gary Neal, Jason Maxiell, Lance Stephenson, Marvin Williams, Michael Kidd-Gilchrist, Steve Clifford.